In this issue: a stormfront builds in alternate 17th century Europe, a half-vampire detective finds himself facing down a deadly enemy, and an unlikely hero of survivors make their way through a post-apocalyptic landscape. All that, plus a new contest. The Ottoman Empire has captured Vienna and is now laying siege to the Austrian government-in-exile established in the city of Linz. Both the United States of Europe and the Kingdom of Bohemia have come to Austria’s assistance, but everyone knows this is going to be a long and brutal struggle. Meanwhile, Poland is coming to a boil. The Bohemians have sent an army into Poland with the goal of expanding King Albrecht Wallenstein’s growing empire in eastern Europe. When Grantville General Mike Stearns sends the Hangman Regiment of his Third Division into the region, they find themselves at the center of a growing storm—one that threatens the continued existence of the United States of Europe. 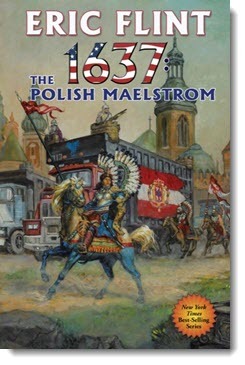 Get 1637: The Polish Maelstrom here. As founder of After Dark Investigations, half-vampire Christopher Cséjthe has seen his fair share of the seedy side of the supernatural world. Most recently, someone cut the gas line of his SUV and then ran over him with a semi-truck while he waited on a tow. But this is the third time Chris has died. It’s old hat at this point for him. Now, awakened in a world he doesn’t quite recognize, he’ll have to use his wits to keep the supernatural world at bay. INTERPOL is interested in some of his associations with Vlad Drakul’s grandson—better known as Dracula—and a trio of witches from Greek myth want him dead—and for good this time. Bad enough. But what’s worse is that the IRS is looking into his tax returns and not at all liking what they find. Now that’s really terrifying! 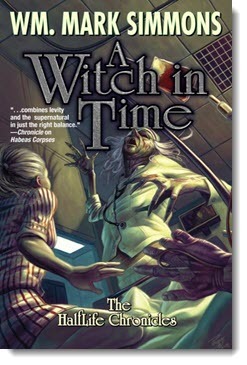 Get A Witch in Time here. It's April Fool's Day. This year, the favorite holiday of pranksters everywhere falls one day before the release of the new entry in Halflife Chronicles, A Witch in Time. The book finds half-vampire PI Chris Cséjthe pitted against all manner of monsters. Which got us thinking: If monsters were real (and we're not saying they aren't, mind you), how would you prank them on April Fool's Day—assuming you had the nerve? Would you replace Dracula's onion salt with garlic powder? Swap the wolfman's plasticware for grandma's good silver (the real stuff)? 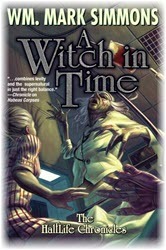 Tell us for a chance to win a copy of A Witch in Time, signed by Wm. Mark Simmons. Last month we asked you to tell us which robot or android was your favorite and why. Congrats to David L. Ball! He wins a copy of Today I am Carey, signed by Martin L. Shoemaker. 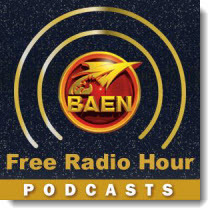 Coming soon to the Baen Free Radio Hour: Wm. 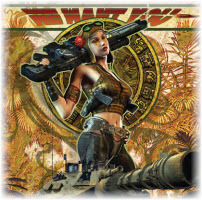 Mark Simmons discusses A Witch in Time, a new entry in the Halflife Chronicles series featuring a half-vampire private detective, and Eric Flint talks about 1637: The Polish Maelstrom, his new solo novel in the Ring of Fire series. Missed past episodes? No problem. We’ve got every episode archived for your listening pleasure. Don't forget to check out the newest ebook releases here. Plus, read “Extracurricular” by Wm. Mark Simmons here. And read this month's nonfiction essay "The Evolution of Body Armor" by Michael Z. Williamson here.